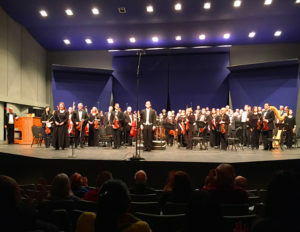 The Elgin Master Chorale, conducted by Music Director Andrew Lewis, concluded its 71st season with a performance of the "Requiem" composed by Maurice Duruflé, on Sunday, April 15 at 3:30 p.m. in the Blizzard Theatre at Elgin Community College. "Ancient sacred Gregorian chants supplied the modal palette that gives this music its ethereal quality, avoiding the usual emotional interpretations of major or minor keys. The orchestra, augmented by organist David Schrader, produced sounds and textures that defied explanation at times, adding to the experience of being between worlds. The power of more than one hundred voices was restrained and reverent throughout most of the Mass, but the full-throated delivery of "Hosanna in excelsis" ("Hosanna in the highest") or "judicare saeculum per ignem" ("to judge the world by fire") moved one's spirit in quite a different way."